At Made in Surveys, we always have an ear to the ground for our clients' needs. After careful research and meetings with key players in the Insight Industry, our team realised that there was a gap in the market for quick and reliable access to consumers. 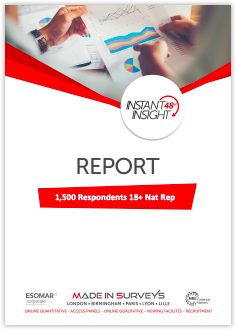 Thus Instant Insight was born: unprecedented fast access to research participants, exclusively for insight professionals. Sampling options can be adjusted to your needs. Please do feel free to get in touch if you have any queries or feedback.